I enjoy many hobbies that most people simply do not. Writing? obviously. 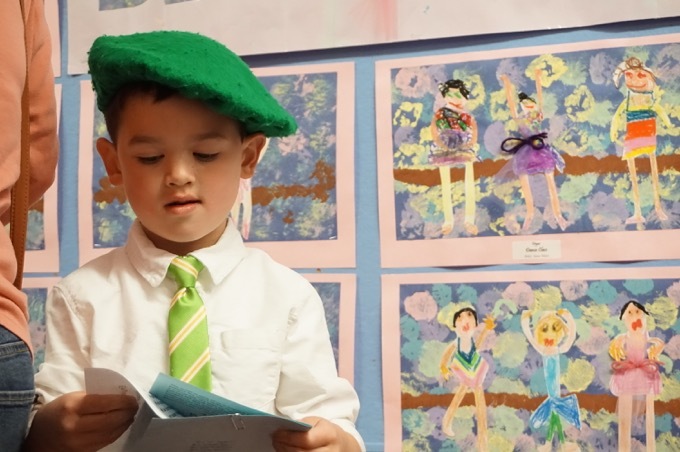 Going to museums? of course. Hiking? anytime. And yes, highpointing. I really do think it’s one of the most fun things I do. It incorporates pretty much all my favorite things: travel, maps, list fulfillment, hiking, experiencing new subcultures and finally, writing about all of that. But this trip would be different than any of my previous 17 state highpoints, for I was alone. Sadly (for me anyway), my partner in crime, my right-hand woman, my muse, my wife did not make the trip out west with me and after much internal debate, I decided to forge on without her. I always knew this day would come – if only because Hoang has a touch of respitory difficulties in extreme situations and I knew the high-altitude hikes would not be in the cards for her. But I always sort of day-dreamt that she’d be by my side for the long Midwestern and high-prairie drives, providing her often hilarious and poignant commentary along the way. Ah yes, the two boys… the reason we had not bagged a highpoint since Damian was in utero in July 2005 for the Florida highpoint. Sheesh, it’s been a SEVEN year highpointing hiatus?! No wonder I was so excited to get going. I was in Denver for a Smith-Magenis Syndrome conference (which one of the aforementioned two boys – Damian – has). I figured I may not again have the opportunity to bookend such a conference with some highpoints, so I planned it all out, studied maps, worked the Internet for the best rental/motel options and flew to Denver. Everything on this first day went perfectly: Everything was on time and plane-to luggage-to-Enterprise-to-highway couldn’t have gone any faster or smoother. But I have to mention the Denver International Airport Enterprise office for a moment. It is completely wackadoo. Most importantly, I was in and out in 2 minutes with no hassle, no up-selling and none of the usual garbage and lies that await rental car customers. That part of the experience was fantastic. But – and I can’t do the scene justice in writing – their particular brand of customer service is just absolutely insane and brain-meltingly annoying. You enter and are immediately greeted by about 30 Enterprisers shouting, “Hello! Welcome to Denver!!! !” with these crazy coke-fueled grins and frantically waving arms. “Um. Hello,” I sheepishly offered. “Hello! Welcome to Denver!!! !” came the repeated refrain. Four or five employees were waving me to their terminal I was confused, more than a little scared and sort of froze on the spot. “Hello! Welcome to Denver!!! !” I heard again through several sets of Cheshire cat-like grins around the room. Just… weird. The woman who ultimately helped me out seemed normal enough, but wouldn’t break her Stepford demeanor. I even told her to calm down, I’m just a guy renting a car and I really couldn’t deal with this Willy Wonka happiness nonsense. She simply smiled ear to ear and happily apologized and asked me how I was loving Denver and my experience at Enterprise thus far. I needed to get out of there… fast. I don’t know if this is a Denver thing or an Enterprise thing. I’m pretty sure I’ve rented from Enterprise before and certainly never experienced such insanity. Looks like the Yelp! reviews run the gamut of Yankee jerks like me who HATE the phony affection and those who actually like it. So why all the introduction? I decided years ago that these highpoint pages will only be about the “hike” to the top and not so much about the trips/vacations surrounding said hike. 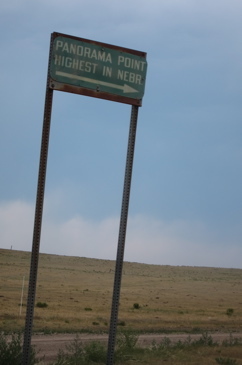 But in the case of Panorama Point, the only “hike” involved is the drive to extreme northwestern Nebraska. And even if I chose (and had time) to hike the last mile or whatever, that certainly wouldn’t provide anything too exciting. Again, this is Nebraska we’re talking about here. That said, the 175 mile drive north and east from the Denver airport really wasn’t too exciting either. Except that is was because of my goal. 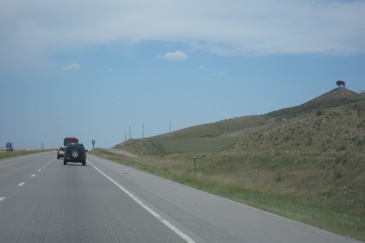 I knew enough to avoid the toll beltway highway around Denver – with rental cars, the screw you up the wazoo for driving those toll roads through all sorts of back end fees – and headed north up I-25 to Fort Collins and Cheyenne, Wyoming. With the speed limit 75mph, I was bummed that my Hyundai Santa Fe couldn’t break 82. Then again, at that speed I was still blowing past everyone for some strange reason. If Connecticut had a stretch of highway with a 75mph limit, the average speed would be somewhere nearer 100. I’m not saying that’s “right,” but I do enjoy getting to where I’m going. 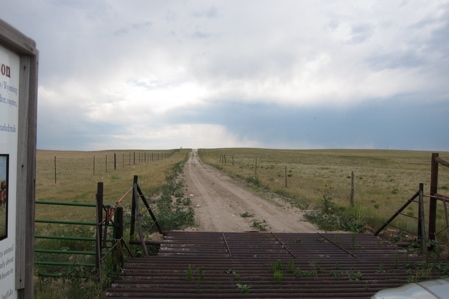 I passed a whole bunch of gates along the highway (and the next one on I-80) that close stretches of Interstate. I assume they close for snow, high wind, tornadoes and wildfires. Fortunately for me, even though devastating fires were destroying parts of Colorado, I had no such issues. Saw a billboard for this place and was intrigued. Wyoming is a fireworks state and the border is crammed with merchants. They grow Wal-Marts WAY bigger out west. There is a massive Anheuser-Busch facility in Fort Collins, CO. I also drove by the actual Sierra Trading Post in Cheyenne. I’d say half my luggage (the hiking half) was purchased through them. I thought about stopping by as I really think they are a great company that sells stuff at great prices. But of course I didn’t as I only had a window of time before the start of the conference and I had a highpoint to get to. Exiting the highway in tiny Pine Bluffs, WY (right at the NE border), I tried to conform to the locals by driving slooooooowly along the town’s streets. People waved to me. Everyone drove a Ford pickup truck. Everyone. Normally, with more time, I’d have loved to have stopped and had a beer (Bud, I’m sure) at a local watering hole. When traveling to such “foreign” places (relatively), there is no better experience than having a conversation with locals. I love it – and here in Pine Bluffs, I would have actually told the truth as to why I was there and felt comfortable that they would be happy about my trek. Oh well. 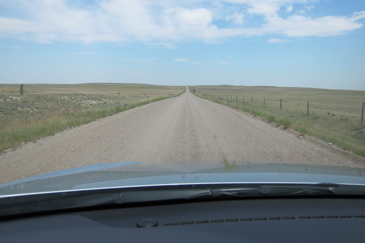 Once through town in a blink of an eye, I was traveling the 2-lane hilly road down south. I tuned the radio to the local AM stations and had my choice of five right-wing talkers going absolutely bonkers about the one hour old Supreme Court ruling on the Affordable Healthcare Act. As one immersed in the industry who has written more than enough white papers and research reports on the healthcare industry, I was astounded by the degree of ignorance about what the bill actually says. These yahoos were spouting such nonsense about the act it was hilarious – but sad at the same time. One minor point: All the directions I have read say to turn on Country road 5 to the highpoint. It was actually signed as Co Rd 5W which caused me a minute of confusion, but I survived. There is a very large, very nice sign at the last road junction before Panorama Point, as well as a lockbox for an entrance fee. There is no amount listed, you just pay what you think is right. 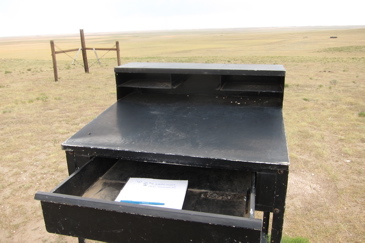 I dropped 3 bucks into the box, read the sign about the bison ranch I was about to enter and drove the last mile or two up the slight incline to the highpoint. Bam: On top of Nebraska. Just. Like. That. 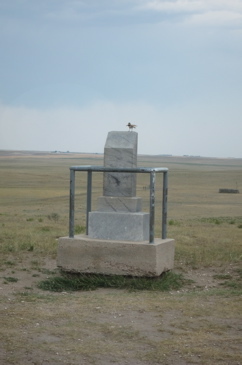 Adding to the number of states that recognize their highest point far more than my own, there is a handsome obelisk as well as a rather out-of-place black metal desk containing a register here. 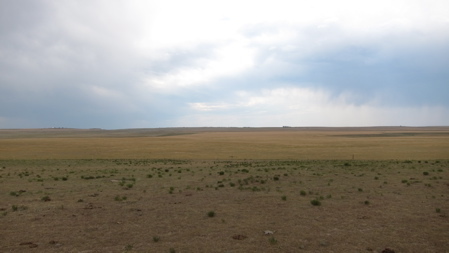 The “view” is actually kind of pretty in it’s own prairie way. Perhaps because the scenery is so foreign to me; I don’t know, but I liked it. 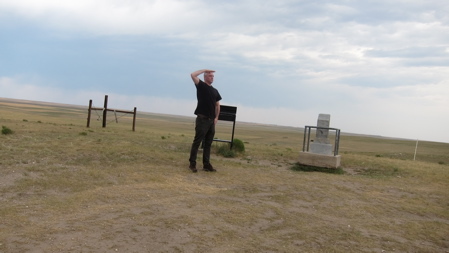 I did see the bison in the far distance – down near the NE-CO-WY tri-point marker that most people go to while up here. Not me, I’m a highpointing purist – with an appointment in Denver at 6 PM. 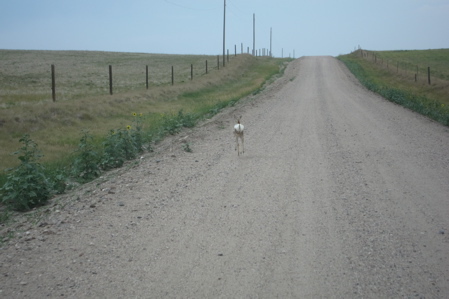 Get out of my way stupid baby mule deer! I took my pictures and hauled back south to the hotel. On the way I had to drive through what I later learned is a perfectly typical 60 mph blast of dust across the interstate, followed by some sunny rain and hail for a mile or two while fighting to keep my Hyundai on the road. Ok, yeah, my account was pretty boring. I suggest you read this guy’s trip report about how he got locked out of his car with no phone here. I’d have been a little terrified. 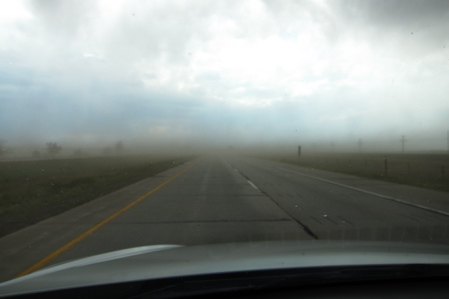 About to drive into a blinding gale-force dust cloud at 80 mph – Adventure! 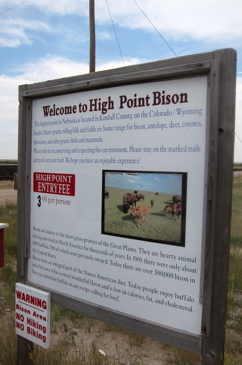 To the next Highpoint: Kansas! 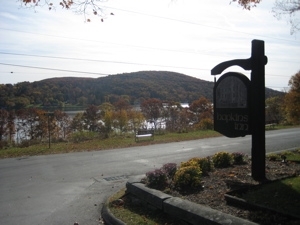 Did you know Philip Johnson once said, “Connecticut is a beautiful state, except you can’t see if because of the trees.” So I guess that is why I love those high plains and prairie shots, it is so different than our tree claustrophobia. Where to, next? Kansas! And yeah, it’s true. 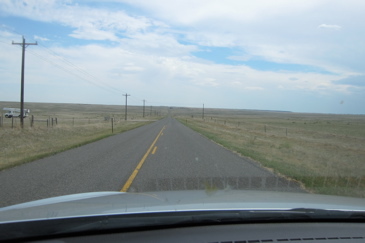 I found the stark beauty of the plains – and later the unique grasslands and mesa landscapes I drove through beautiful in their own way. I rented a car from Enterprise a couple months ago when mine was in the shop, and even though it was a small, in-town office the workers seemed rather more enthusiastic than one normally encounters in the service industry. It’s a safe bet that the employees hate having to show such phony enthusiasm. I’m pretty sure that’s a baby pronghorn and not a mule deer.